Imagine the potential energy savings when you can choose not to heat or cool unused rooms, such as guest bedrooms, while at the same time keeping bedrooms or the living room at the perfect temperature for comfort. A ductless split system is also a great option if you have a converted attic, new addition or finished basement. These high-efficiency systems can also help you save money by helping to keep your most-used rooms optimally comfortable, so that even if you have ductwork, you can potentially spend less on heating and cooling costs for the rest of your Raleigh area home. We are proud to offer the Mitsubishi Electric wall-mounted ductless split systems, among the highest quality, most energy-efficient ductless split systems available. At Weather Master, we can help you get the system that fits your needs. Comfort without Compromise. Keep the rooms you use most at precise temperatures for comfort. Keep the kitchen a little cooler than the rest of the house, or maintain your garage at a comfortable temperature. Even difficult-to-maintain rooms are easily controlled with a multi-unit system, because each area has its own control unit. All this adds up to maximum comfort, maximum efficiency, and minimum utility bills. Cost Effective Choice. Ductless min split systems are an easy solution to bring comfort to rooms without ductwork or with hot or cold spots. Ductless system installation is minimally invasive with no patching or painting required. This makes a ductless system a much more cost-effective solution than adding ductwork or increasing the capacity of the current HVAC system in your Raleigh, NC area home. These high-efficiency heating and cooling systems can also help you save money by helping to keep your most-used rooms optimally comfortable, so that even if you have ductwork, you can potentially spend less on heating and cooling costs for the rest of your home. High Efficiency Systems. Mitsubishi Electric systems offer efficiency up to 26 SEER. Both systems qualify as Energy Star rated. Wirelessly Control Each Space. Comfort is more than controlling heating and cooling. It’s being able to do it effortlessly. A wireless remote control option is another way ductless offers personal comfort from every angle. New Technology revolutionizes the heat pump. Unlike older, inefficient heat pumps, with Mitsubishi Electric’s systems cold air delivery is eliminated. Larger coils heat faster, and the Hot Start™ system doesn’t activate the fan until the desired temperature is reached so it never blows cold air. Quiet Operation & Allergen Filtration. Mitsubishi Electric offers advanced multi-stage filtration systems that dramatically reduce allergens and help eliminate odors. And their indoor units operate with sound levels starting as low as 19dB; that’s even quieter than a human whisper. 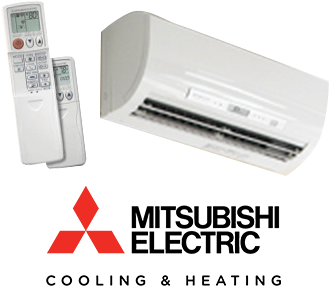 For more on Mitsubishi ductless mini splits or any of our other products and services, please contact us. Don’t forget to ask us about our exclusive 100% Satisfaction Guarantee!